Pink Pyramid Lake• We live in a funny world. 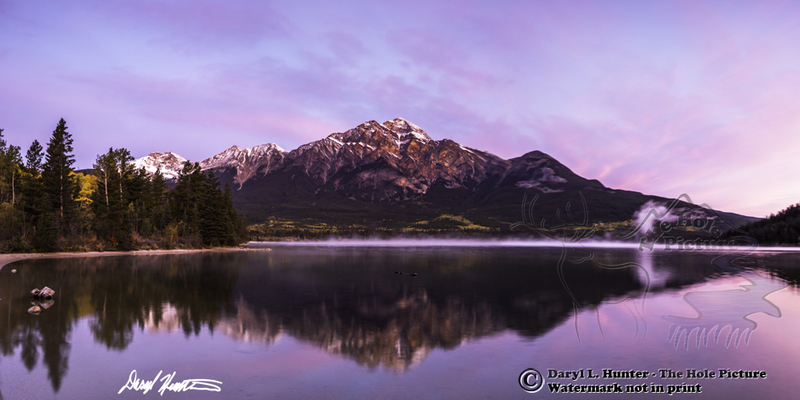 This sunrise at Pyramid Lake in Jasper National Park was actually brighter and pinker than what I publish here. Because of reckless photographers over saturating their work, a naturally vivid landscape is now thought to be a product of Photoshop. Since I want my photography to have integrity, here and on a few other photos, I have desaturated a few of natures amazing gifts so I wouldn't be accused of enhancing the color. Maybe it isn't so funny. I still retained enough pink to still tell the tale of a brilliant sunrise.